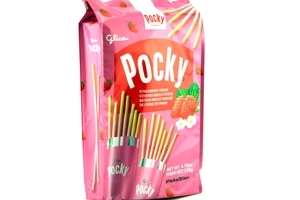 Glico Pocky Strawberry Flavor in 4.47oz (127g) Bag. Contains 9 packs per bag. Strawberry Cream covered biscuits sticks. This party pack of pocky includes 9 packs of Glico Strawberry Pocky. ideal for a party, or for serious snackers. Strawberry Pocky sticks are light, delicious biscuit-like cookies coated in sweet strawberry frosting. Strawberry Pocky sticks make a perfect snack, or simply a tasty finish to your favorite Asian meal. Product of Japan. wheat flour, sugar, vegetable oil (palm oil, sunflower oil, citric acid), lactose, whole milk powder, margarine, palm oil, salt, artificial flavor, beta carotene color.